Suwanee, Ga. (October 30, 2012) – Following the overwhelming feedback from Jeep® owners online and the success of theRugged Ridge® Modular XHD Snorkel System for 2007-2011 Jeep Wrangler JK 3.8L V6, Omix-ADA®, today announced the availability of its new, patent pending Rugged Ridge Modular XHD Snorkel System for two and four-door Jeep Wrangler JK models from 2012-2013 equipped with the 3.6L V6 Pentastar engine. The new Modular XHD Snorkel System is available in easily interchangeable high and lowmounts, and relocates the vulnerable stock air intake through an internal duct system justbelow the windshield. This new design provides optimum performance and protection aswell as a great look over existing, more conspicuous options. Installation requires onlyminor modifications to the internal fender flange and avoids the major cutting that other kitsmay require. Featuring the option of a high-mount ‘ram’ design or the standard low- mount intake, JK ownerscan easily customize the installation and functionality of their new Rugged Ridge snorkelsystem to best suit the needs and off-road conditions they may face, including tackling harshdusty trails or deep water fordings. Rugged Ridge’s snorkel is manufactured from durable heavy gauge plastic, mandrel bent aluminum and high temperature silicone connecting hoses. A built-in valve allows owners to clean and drain a catch basin, preventing water from entering the intake system while out on the trail. Because this system retains the use of factory style air filters, it is not compatible withother aftermarket cold air intake kits and snorkels. Rugged Ridge Modular XHD Snorkel Systems are covered by a new industryleading five-year limited warranty and are available online and through select Jeepand off-road parts/accessories retailers nationwide, starting at $319.99. 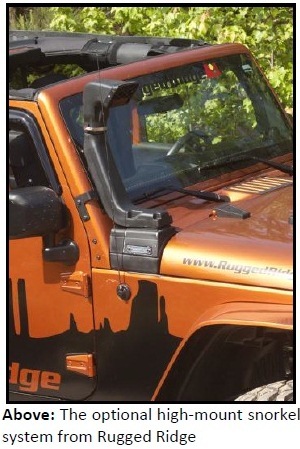 For more information on Rugged Ridge’s complete line of high-quality Jeep and off-road products, or to find an approved retailer, please contact RuggedRidge at (770) 614-6101 or visit their website at www.RuggedRidge.com.